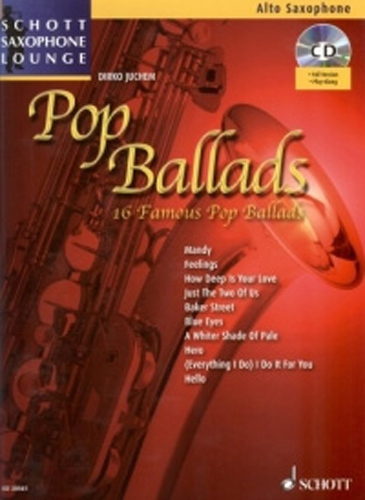 Pop Ballads Alto Saxophone Lounge.Book and CD. 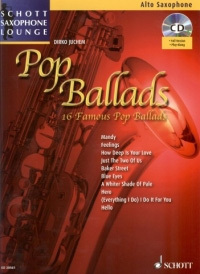 Song book contains 16 famous pop ballads. these refreshing. easy to play arrangemets are all included on the accomoanying CD. performed by the author himself.Songs inc. Mandy. Feelings. How Deep Is Your Love. Just the Two of Us. Baker Street. Blue Eyes. A Whiter Shade of Pale. Hero. Georgia On My Mind. Hello. All By Myself. Aura Lee Plaisir DAmour. Rondo. Those Were The Days.and Everything I Do I Do It For You.